One of the best loved music festivals in the world has attracted a star-studded lineup for its 19th edition. Headlining The Fes Festival of World Sacred Music this year is the celebrated American singer-poet Patti Smith and the legendary flamenco guitarist from Spain, Paco de Lucia. For eight magical days from 7 to 15 June, visitors from many countries will gather in Morocco’s ancient spiritual, cultural and intellectual capital, for a feast of musical offerings from around the world in a fascinating diversity of venues. Patti Smith and Paco da Lucia will be playing beneath the stars in the sky at the 3,500 seater Bab Makina – a parade ground attached to the Royal Palace surrounded by castellated walls. One festival visitor described the Bab Makina as “like walking into the Arabian nights”. The 2013 festival theme Reflections of Andalusia is celebrated on the opening night at the Bab Makina with Love Is My Religion — a specially commissioned dance, poetry and musical extravaganza directed by the dance maestro Andres Marin. More than 30 Arab-Andalusian, Sufi, Amazigh and Spanish flamenco artists will take part in the spectacle. Afternoon concerts and some evening ones are staged under a giant Barbary Oak tree in the Andalusian gardens of the Batha Museum. This is an ideal location for more intimate events, featuring solo performers and smaller ensembles. This year the festival welcomes Nomadic voices from the steppes of Mongolia and the mountains of Sardinia, a Turkish musical journey with a Byzantine choir and whirling dervishes, together with musicians from Egypt, France, Lebanon, Mauritania, Syria, South Africa and Morocco. The Batha is also one of three venues chosen for the Nights in the Medina, regarded by many Fes aficionados as the heart centre of the festival. For three evenings, visitors roam the alleyways of the medina, the old city and the largest of its kind in the world. As they walk from one concert to another, they are immersed in a way of life that remains almost the same as it was in medieval times. Nights in the Medina performances at Batha, Dar Adiyel and Dar Mokri include Pandit Shyam Sundar Goswami from India, the Jewish-Muslim El Gusto ensemble from Algeria, sacred songs from the kingdom of Bhutan and the Fado talent of Portugal’s Ana Moura. Many international visitors choose to join the citizens of Fes who gather in their thousands at Place Boujloud for the free concerts staged as the Festival in the City. These are sometimes experimental and usually loud and exuberant. At the end of each day, the action moves to the Dar Tazi, the home of the festival organisers, The Spirit of Fes Foundation. Here on the edge of the medina, Sufi ensembles from Morocco and beyond conjure up mystical ecstasy with music, chanting and support from enthusiastic audiences. This year the festival welcomes the return of Chris Ekers as sound supremo, following a two year break while he was Head of Sound Production for the opening and closing ceremonies for the 2012 London Olympics and Paralympics. The 2013 theme, Reflections of Andalusia, explores the cultural and spiritual relationship between Fes and Moorish Andalusia, which flourished for 800 years until the late 15th century. The Moorish period was renowned for its religious tolerance, music, poetry, great philosophers and tradition of courtly love. 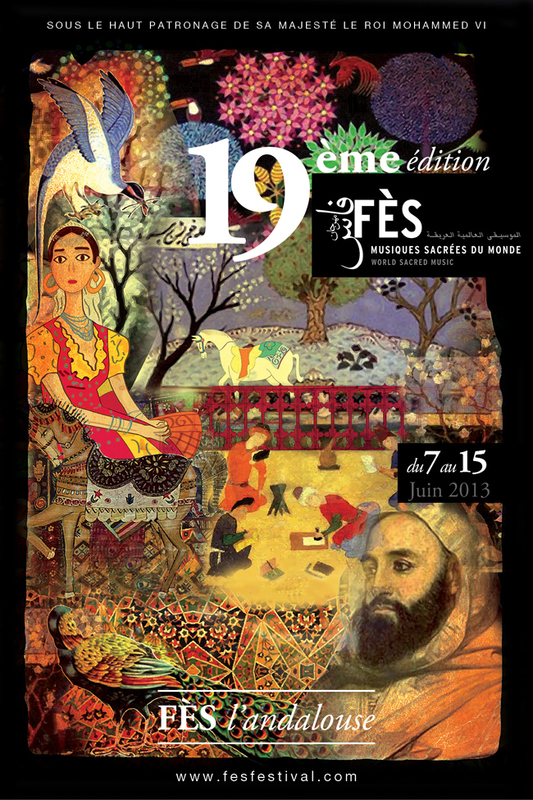 The 2013 Fes Festival has been chosen as one of the top 25 international music festivals by the world music magazine Songlines. This entry was posted on 28 March, 2013 in homepage and tagged 7th-15th June 2013, Bab Makina, Fes Festival of World Sacred Music, Mary Finnigan, Morocco, Paco de Lucia, Patti Smith. Bookmark the permalink.